Brazil is renowned for its gorgeous beaches. At least once a year, during Carnival, you’ll see panoramic shots of Copacabana and Ipanema beaches, framed by those iconic granite cones, called morros. It’s easily accessible from the capital city of São Paulo. The infrastructure and services are good, as São Paulo is the most prosperous state in Brazil. The natural beauty is simply breathtaking. A great variety exists, from sprawling touristy beaches to nooks only reachable by boat. Great deals can be found, as Brazil struggles out of its financial crisis. Locals typically divide São Paulo’s coastline into the Litoral Norte (North Shore) and the Litoral Sul (South Shore). In this article we’ll explore three areas of the North Shore, with a peek at a few more in next week’s article. This region is best explored by car. First, you can relax as folks here drive on the right side of the road, the same as in North America. The highways in this region are generally good, although use caution and common sense when exploring off the main roads. Many rental companies are available such as the reputable national chain Localiza. You’ll simply need to present a passport, valid driver’s license from back home, and a major credit card to get a car. You don’t need to have an international or inter-American license. You can rent a car in São Paulo, but I suggest you avoid the hassles of driving in the big city by taking a bus to Santos or Guarujá on the coast (where we’ll begin our explorations) and then rent there. During your drive you can enjoy great views of the Mata Atlântica (Atlantic Forest) from the elevated highway. Santos and Guarujá, together with neighboring São Vicente and Praia Grande, form what is termed the Região Metropolitana da Baixada Santista, or the metropolitan area that serves as a divider between the North Shore and the South. Heading north (though it’s actually more east on this stretch of coastline) on highway BR-101, you’ll encounter the following municipalities: Bertioga, São Sebastião, Ilhabela, Caraguatatuba, and Ubatuba. From Santos to Ubatuba is a tad under 175 miles. I’m going to take you through the first three towns today and save Caraguatatuba and Ubatuba for next week’s edition. Bertioga (pop 57,000), just north of Guarujá, is the North Shore city closest to São Paulo. It lies squeezed between the South Atlantic and Restinga de Bertioga State Park. Bertioga is perhaps not as popular with the locals as neighboring towns. However, São Lourenço Beach and the adjacent Riviera de São Lourenço are popular, if a bit pricey. Continuing northward, greater São Sebastião (pop 83,000) lays claim to some of the more popular beaches in the Litoral Norte. Juqueí (sometimes spelled Juquehy) used to be the strand’s premier beach and is still popular with older folks. 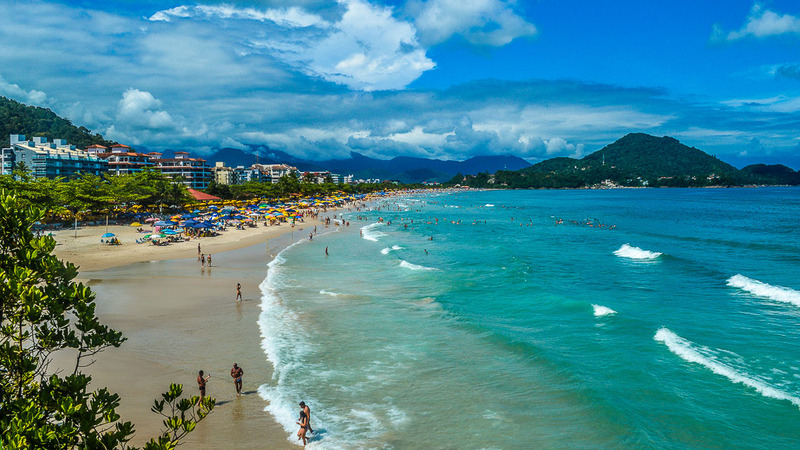 It’s flanked by the smaller Barra do Una to the south, where a yacht club is located, and Barra do Sahy to the north, which is frequented both by surfers and families. Farther north, closer to the town of São Sebastião itself, lies trendy Maresias, home of Brazilian surfer Gabriel Medina. Ilhabela (pop 32,000), which means “beautiful island,” lies just off the coast of São Sebastião. 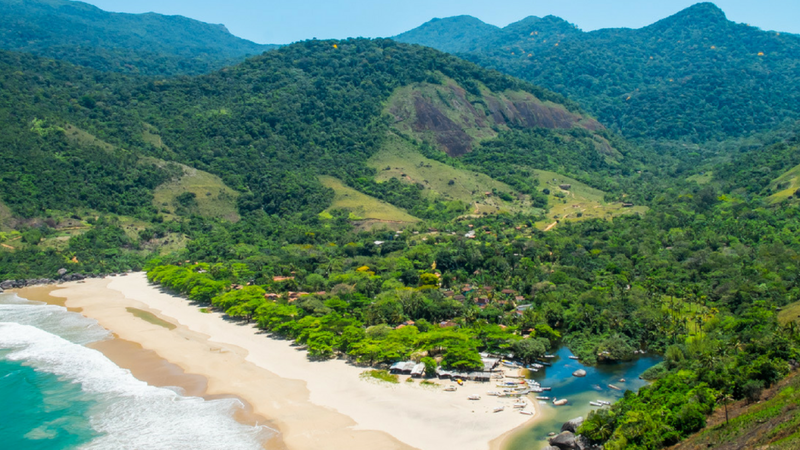 Everyone you talk to has nice things to say about Ilhabela. Although it’s the smallest town in the region, its residents are largely well-to-do and its infrastructure is therefore good. The town lies on the leeward side of the island, of which about 85% comprises a state park. Outdoor activities, especially water sports, abound. Fishing, sailing, wind surfing, and diving are all popular. Popular beaches include Bonete and Baia de Castelhanos on the wild, little-developed southern tip of the island. Ilhabela does, however, have a couple of drawbacks. It’s reachable only by a 20-minute ferryboat ride, and the ferry doesn’t operate when winds exceed 25 knots (29 mph). Also, virtually everyone warns about the borrachudos—biting black flies that are especially active at dawn and dusk in the warmer months. While they don’t transmit disease and aren’t a significant problem in the town, they can be an annoyance, especially on the south end of the island. Ilhabela is also pricey for Brazil. Brazil is still struggling out of a recession, which continues to suppress sales and prices. That fact, coupled with high inventory and favorable exchange rates, means that bargains are yours for the taking. However, I would not look for rapid price appreciation. Rather, this is an area to buy in because you like it. I’d suggest exploring the length of the region. If you find a location you really like, look at several properties. You’ll need to use a few different real estate agents because Brazil does not yet have a multiple listing service. So each agent holds his or her own list of properties. If you see a property you like, bid low. Although Brazilians are loathe to reduce a price, with enough cash-strapped owners out there, someone is likely to accept a low cash offer. And you’ll want to have cash here. Banks will rarely provide financing to foreigners. Some developers might provide limited financing, but cash is decidedly king. If you have cash in hand, you can find some attractive deals, especially with the current exchange rates. In general, look for units in condominium buildings. These provide amenities, security, and the opportunity to meet others. Single-family homes can be targets for break-ins, especially if left vacant for extended periods. The exception would be Ilhabela, where you’ll find a predominance of single-family homes. One final note: In Brazil, and indeed across much of Latin America, new construction is typically only semi-finished by North American standards, meaning you’ll need to install lighting fixtures, cabinets, etc. Resales, of course, will be kitted out, and sometimes resale units even come fully furnished. This house in a tranquil, closed condominium development in the Água Branca section of Ilhabela is a great deal. Its 92 square meters include two bedrooms (one en suite) plus a social bathroom, kitchen, living room, laundry area, and parking space. The development has a pool and barbecue area. The asking price is 400,000 reais (US$109,290), with monthly association fees of 550 reais (US$150) and monthly taxes of only 150 reais (US$41). Or, to feel surrounded by nature, you might just love a rustic, airy house in Ilhabela. It has a cathedral ceiling, balconies with hammocks, a deck, and sits on a peaceful wooded lot. It has three bedrooms (one en suite), a second bathroom, large living room, and garage. The house comes furnished, and the asking price is 770,000 reais (US$210,383). Alternatively, a two-bedroom, one-bath “duplex” unit (which in Brazil indicates two floors) is available in the Boracéia section of Bertioga. The 72-square-meter unit comes with a reserved parking space, is only 4 years old, and located in a small building of only 20 units. The building has a pool and is located just a block and a half from the beach, which is certified to be one of the cleanest in São Paulo. The asking price is 410,000 reais (US$112,022), with monthly fees of 340 reais (US$93). If you aren’t ready to buy right away, no worries. Scads of rental units are available in every town. Leases of up to 90 days (called por temporada) are easily arranged. Selection is best and prices are lowest around the end of September or the beginning of October, which is springtime here. 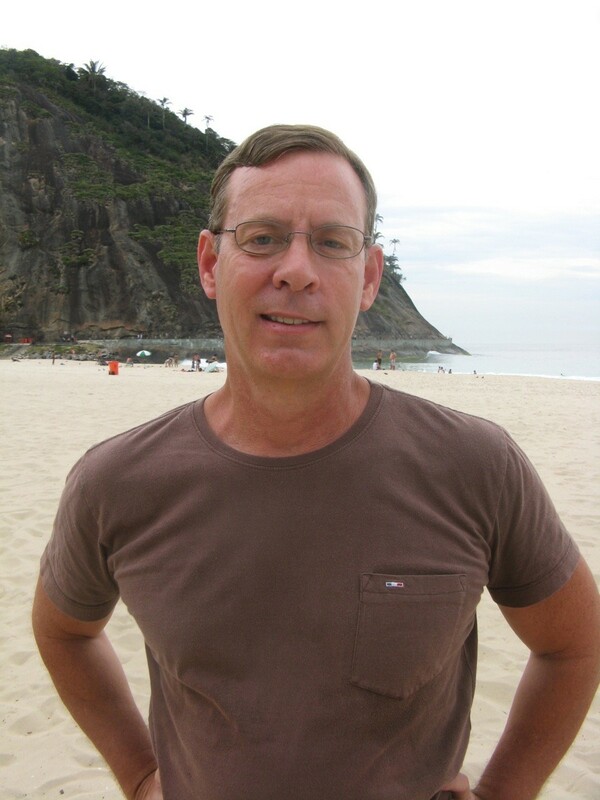 We still have two more towns to visit, so check back next week when I’ll introduce you to Caraguatatuba and Ubatuba. I’ll also provide a wrap-up of the area and tips about where to explore.